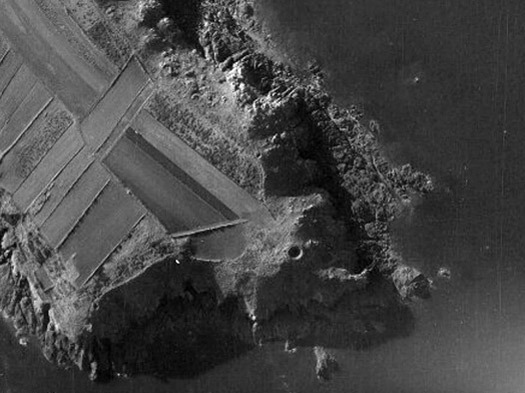 Ra107 Pointe du Meinga, K.V.U. Gruppe Festung St Malo, K.V.Gruppe Rance. 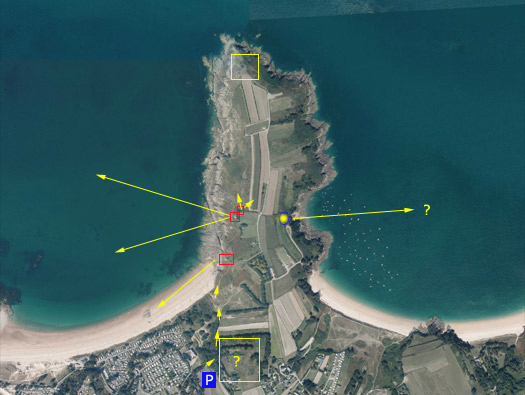 Ra107 Pointe du Meinga, Festung St Malo. 1 x SK/Schartenstand for a 5cm KwK gun. The Pointe sticks out pointing due north, the yellow square ? 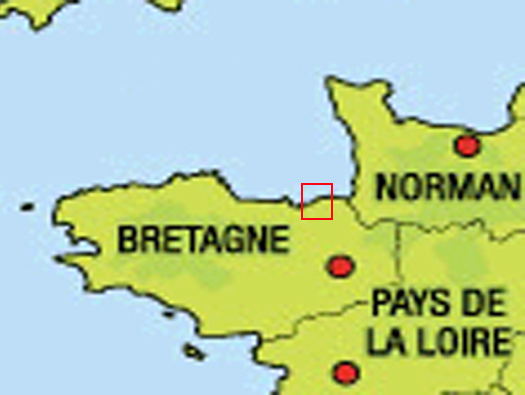 I have a 1950's which shows what look like bunkers and three red squares where I did find bunkers ant the last yellow square on the north tip is a bomb crater one of many that were here around the fall of St Malo. 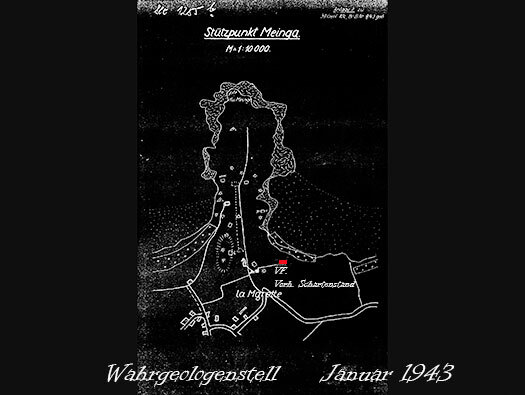 The yellow dot looks as though its a bunker but I did not go that far. The bombing of France by the USAAF. 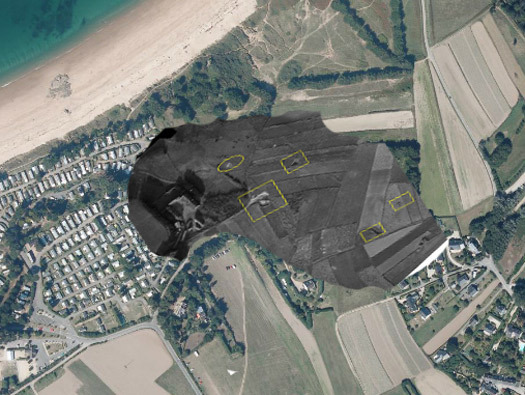 I have super imposed where I think the bunkers were placed. The centre one looks as though it was in process of being built. A close up of one of the bunkers. The path to the point. The path to the pointe a bit further on and the fence posts are made from old beach defences. These would have lined the beach in at least two rows. SK/Schartenstand for a 5cm KwK Pak gun. Looking along the headland with the SK/Schartenstand in the middle distance. Steps run down to a trench, left to the SK/Schartenstand and right R600 bunker. Set into the rocks this bunker would have been very hard to knock out. A very heavy concrete cab was used to cover the start of the trench. The rear of the gun room with the rear door and a small ammunition space in the corner. 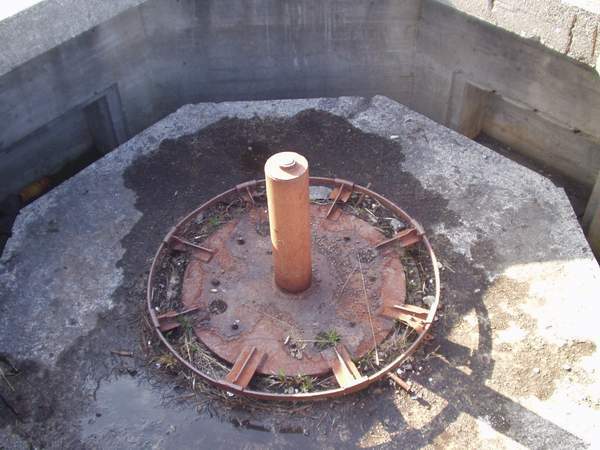 The base of the guns mounting that lifted into the square slot on the concrete base. When fitted and bolted down, the gun fits over the pintail. Cut out of solid rock. Passageway with a small storage area at the end. R600 bunker crew room door. A 19P7 thin steel door into the crew room. A 19P7 thin steel door with a rubber gas seal all the way around it and a small glass window. Left side is the gas filter. Right is the escape hatch. R600 bunker door to ammunition room. A double heavy steel door in two parts to the ammunition room. Niche at the end of the passage. A small storage area at the end of the passage for personal equipment. Steps down and the stone wall is shaped to allow a machine gunner to cover the entrance. The View of the beach defended. SK/Schartenstand on the right and a R612 on the left. 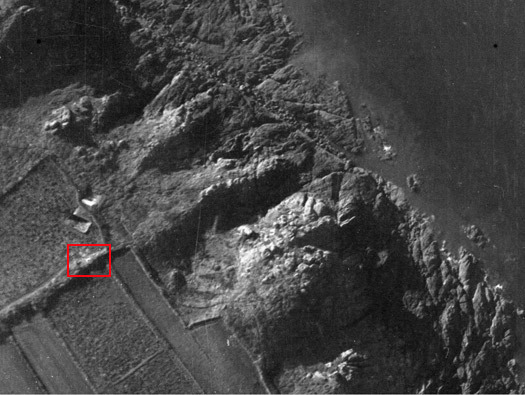 Above the red square is the R612 casemate for an assault gun and the red square is a Tobruk. R612 with two small ammunition spaces. R612 set nicely into the cliff face. A nice shape over the door to stop rain water dripping into the front door. Still here after all these years an Eisenpfahel barbed wire support where barbed wire entanglement would have been placed both sides of the casemate and possibly minefields in front and behind. R612 view through the rear door. The area the gun would have covered. Hedge row with a Tobruk in it. The Tobruk in the hedge. I am not sure if this Tobruk is not a modified type? Tobruk looks as it does not have a rear storage area? 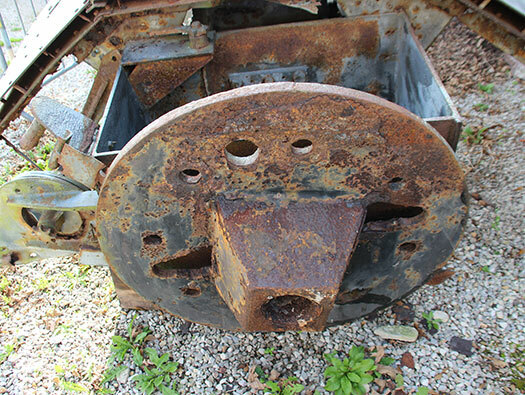 Looking into the machine gun ring. A mounting that fits into the gun ring on the Tobruk and a machine gun set on it and a place to rest your elbows. Another form of ring mount. This may have been a machine gun position? Note the bomb crater right on the pointe, there were at least three here. The three bomb craters that can be seen today.